• Opens some/all of Lake Alice, Silver Lake (Benson Co), Rose Lake and Lake Ardoch National Refuges to some seasonal fishing. The US Fish & Wildlife Service pursued and received approval to permit recreational fishing on a few northeast North Dakota refuges. Most notable was the opening of Lake Alice to ice fishing. • Eliminated the closure of a portion of Baldhill Creek to spring fishing, an outdated restriction that is no longer needed. • Reduction of the statewide possession limit of bluegill, yellow perch and white bass from 80 to 40 each. The statewide standard is for possession limits to be twice the respective daily limits. However, currently yellow perch, bluegill and white bass are four times the daily limit. Reducing their respective possession limits to 40 would address the desires/requests of many resident anglers fishing rural lakes, as well as normalize the possession limits with the statewide “double the daily” standard for other species. • Opens Sweet Briar Dam and Braun Lake to Dark House Spear Fishing (DHSF). Closes Larimore Dam and Wood Lake to DHSF. In all cases, these changes are due to the absence or presence of muskie. Lakes that have muskie populations are off limits to DHSF due to the potential for improper identification. There are very few muskie left in Sweet Briar and musky stocking has been terminated. Too many problems with illegally introduced pike and carp. Wood Lake and Larimore Dam will received musky stockings this year. 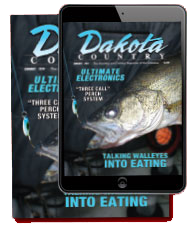 • Eliminates largemouth bass and northern pike length restrictions on Red Willow Lake and largemouth bass length restrictions on North and South Golden lakes. Despite minimum length restrictions for these species being in place for years, fish surveys have not yielded positive results and thus the removal of this restriction. • Silver carp can now be harvested by any legal means. Silver carp and common carp are treated the same. Both are aquatic nuisance species that may be harvested. • One snapping turtle may be harvested annually between July 1 and November 15. There is some evidence that snapping turtle populations are declining. This rule provides some reasonable safeguards, preventing an individual from excessively harvesting too many snappers in one area in one outing, including the closing to harvest during their breeding season. • Markers must be in the possession of anglers and/or spearers as soon as a hole greater than 10 inches in diameter is made. This measure will be a good reminder to the spearers and anglers to think/plan in advance of participating and ensure markers are readily available, versus realizing after the fact and scrambling to find something legal to use as a marker. 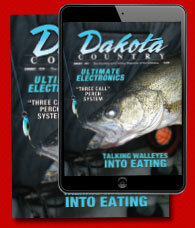 • Free Fishing weekend during ice fishing season one weekend during the holidays, ND residents only.